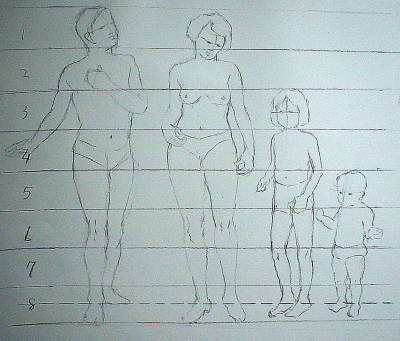 As you learn to draw people, developing an understanding of overall body proportions and the geometrical shapes that make up the human body will help you achieve a convincing likeness. Also, you want to avoid some of the pitfalls beginners often stumble into so stay mindful of common mistakes and the poor habits that lead to them. If you have time, find a good book on human anatomy and study the musculoskeletal system that makes up the fundamental structure of a human body. For a quick start, look at the proportional relationship of a human head to its body length. You can see that, when standing fairly upright, an adult man's body is about 6 to 7 head's in length. For a woman, it can be the same or maybe shorter. As for children, the younger the age, the smaller the ratio, say 1 to 5 or 1 to 4 in a toddler. This is just an average, of course, since there are wide variations among individuals. Once you establish the overall ratio of head to body length, turn your attention to the basic shapes that make up the parts of the body. At this stage you want to break the body down to several simple large masses. In frontal view, a person's torso or trunk can be viewed as an oval supported by a spinal cord. The hip line divides the body in half (top and bottom). The distance from the top of the head to the hip line is roughly equal to the distance from the hips to the soles of the feet. 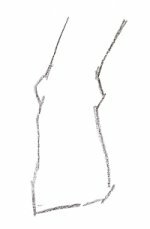 When the arm is hanging straight down at one's side, this line aligns with the inner wrist. As artists, this is the sort of information you use to keep your figures convincing. Draw the pelvis as a block and connect it to the torso via the spine. When you learn to draw people, getting the center line of the torso correct, both front and back, is very important. 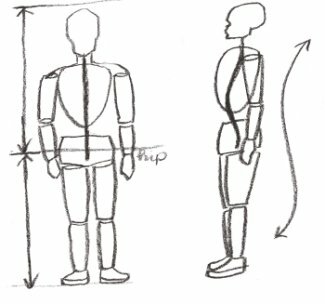 It is always a good idea to use this line as a checkpoint, especially in the three-quarter view when the person you are drawing is in perspective. Arms and legs. Look at them as irregular cylinders connected with joints. Some artists liken the shapes of the arms and legs to blocks. 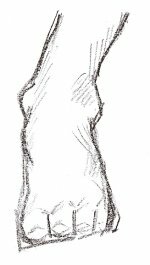 The most natural way to construct the arm is to block it in as two cylinders of about the same length; one for the upper arm from the top of the shoulder to the elbow; and another for the forearm from the elbow to the wrist. The leg? In profile it presents an elongated “S” curve. The leg resembles two cylinders of equal length: one from the upper thigh to the kneecap, and the other from the kneecap to the inner ankle bone. Draw your kneecap like as a ball between the thigh and the calf (accounting for its somewhat round shape). Lastly, don't forget the feet. 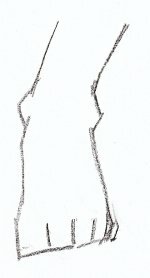 When you draw a foot, try blocking it in with straight lines for a strength and support. And then block in the toes as small cylindrical forms. Learning to draw the toenail properly, as they will help put the foot in perspective. This is important, because all views from the front present the foot in perspective. You can look at the above diagrams, as well as other pictures and your own body, but there is no substitute for drawing from a live model when you desire to learn to draw people. If you can't find a life drawing class in your area, you should start one. Perhaps you can get members of your family, a classmate, or a friend to pose while resting, reading, or even watching television. I highly recommend this book for learning how to draw from a life model.